On April 1, 2018 (Easter Sunday), Rockhill Mennonite Church and Ridgeline Community Church joyfully celebrated the resurrection of Jesus together in a nearly-filled-to-capacity Rockhill meetinghouse. This service was the culmination of a year-long journey of prayer, discussion, and discernment about the possibility of joining together officially as one church, united in God’s mission and service to the community. On the previous Sunday, each church individually affirmed their desire to merge together with nearly unanimous votes from both congregations, confirming the vision of the new entity. 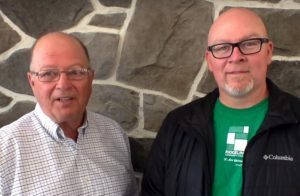 The new merger will be led by Gibson Largent, who is the founding pastor of the Souderton church plant named “Ridgeline Community Church.” The joint venture will be meeting at the former Rockhill Mennonite meetinghouse in Telford. This merger process started organically early in 2017 when Rockhill’s pastor, Larry Moyer, informed the Leadership Team of his desire to retire within the coming year. At the same time, persons from Rockhill had started to relate to Pastor Largent through their involvement together in several community-run ministries. At the time, Ridgeline was meeting at the Boys and Girls Club in Souderton. Conversations about some sort of joining together started very slowly. In fact, the idea began as only a simple thought that started to grow into a possibility and then became intriguing to both parties. In the months ahead, differences in structure, theology, vision, and outreach were discussed together and prayed over by each congregation. Although there seemed to be a lot of hurdles to jump over, as well as many difficult decisions that needed to be made along the way, the doors of opportunity towards merging never closed. In November of 2017, the congregations decided to explore more deeply the possibility of merger by holding 4 joint worship times together. They also engaged in fellowship meals and other opportunities to help to get to know each other better. During this time, both congregations saw a lot of sameness and unity in their core vision and purpose. 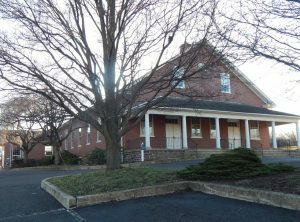 Indeed, their styles of worship were very similar, they both were passionate about the Gospel and the scriptures, and they both had a desire to connect with the communities of Souderton and Sellersville around them. The decision was then made to keep moving forward and begin working at all the details necessary in making the possibility of a merger a reality. Legal issues involving the property and the cemetery needed to be dealt with, budgets and general structure had to be talked about, and areas of responsibility and accountability needed to be set up. While all of this was being discussed, both congregations still held meetings that allowed persons to share their concerns and support for the merger. There was deep sense that God’s Spirit was moving through the process. Denominational allegiances and personal preferences were put aside as there was a feeling that God was doing a work of synergy through the coming together of two groups. As this chapter of Rockhill Mennonite Church closes, their past will always be with us and will be remembered. In 1735, several families moved to West Rockhill Township and started a faith community that they called Rockhill Mennonite Church. It was founded as a church that would be located in the community that they resided in and was to be a lighthouse for the community in which they lived. Since that time, Rockhill has served the community and the Franconia Conference well. They have sent out persons into the broader church who have impacted the church around the world. Indeed, their own J. C. Wenger is one of the most well-known historians and theologians in the Mennonite Church to this day. The writings of Magdalene M. Derstine have been treasured for their inspirational content for many generations. And without the passion for history that John D. Souder exuded in forming the local Mennonite Historians, we may have lost a lot of treasures from our past. But as this new chapter of the Rockhill story unfolds, it is clear to see that the church and its merger is simply an extension of the original story. A story of Christian brothers and sisters being faithful to their original calling and purpose – and that is to exist for the community around them for the sake of Christ. May God bless this new work and use it for God’s glory!